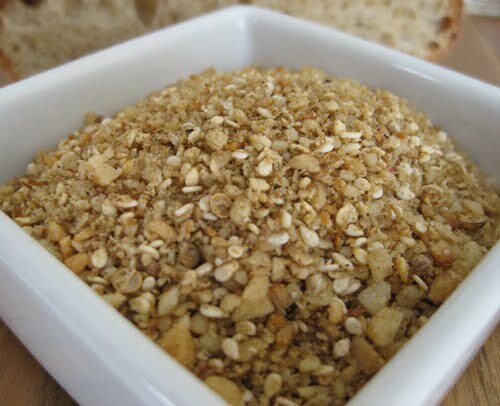 Dukkah is a mix of coarsely ground nuts, seeds and spices originated in Egypt. I was introduced to dukkah a few years ago and since it has become a staple in our house. 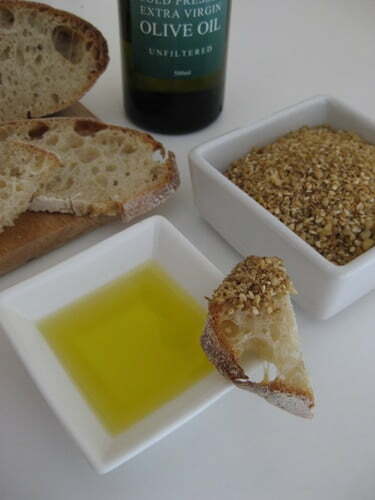 The best way to enjoy dukkah is with some freshly baked bread dipped in olive oil and then in the aromatic mixture. Add a glass of wine (red for me, please) and you’re in heaven. There are numerous dukkah recipes, each having its own ratio of different nuts, seeds and spices. The basic ingredients are nuts, sesame seeds, coriander seeds, cumin, pepper and salt. Dried thyme or mint can be added, dried chilly, anise seeds, fennel seeds etc. As for the range of nuts, most commonly almonds and hazelnuts are included, however, you can add pine nuts, pistachios, macadamia, cashew nuts or combination of these mentioned. Dukkah is really easy to make. My favourite recipe includes the basic ingredients only and is made with the Aussie macadamia nuts. Use this recipe as a guide and experiment with different nuts, spices and the amounts until you have your own special blend. Put coriander and cumin seeds into food processor and pulse. I prefer to use ground cumin, because seeds can be hard to crush. A heavy mortar and pestle or coffee grinder can be used for that, but I find it faster to stick to one appliance (and less to clean afterwards). Add nuts, ground to coarse consistency. Dukkah is a versatile staple to have on stand-by for any occasion. 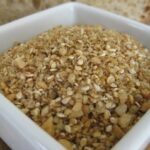 To make nut free dukkah, substitute roasted pumpkin seeds (pepitas) and/or roasted sunflower seeds for nuts. Meat or fish coated in dukkah before baking is especially delicious. Sprinkle dukkah over poached eggs, avocado, salad or add to sandwiches. Homemade dukkah in an attractive packaging makes a great present. Aromas of dukkah mix and freshly baked bread will impress even the fussiest guests! This is the best dukkah I have tasted! Thanks for the recipe. Thank you Cherie. It tastes even better when you share it with friends :-). Hi Vesna, I was planing to make Dakkah for gifts and was wondering how long it will keep for. Dukkah will keep at least one month in an airtight container, maybe even longer, but ours is always eaten or given away before. Keep it in the fridge if you plan to store dukkah for a longer period or make now for Christmas presents. There is nothing in there that will spoil, but nut oils could get rancid. Want to package the dukkah – can I seal it in cellophane bags – want to use as presents at Christmas time?? You can put dukkah in cellophane bags, Maureen. As with most spices – the fresher, the better. I rubbed this on a lamb leg roast and slow cooked it, and it was great. Thanks for the introduction to dukkuh! You are a life saver! I have been to 3 supermarkets today as my daughter loves dukkah and bread. While in the last supermarket. I googled how to make it. Your recipe came up. Thanks so much. Can’t wait to eat it tonight…and tell her I made it! Thanks for your feedback Deanna! Hope your first batch was a success and your daughter liked the dukkah you made for her. I saw a recipe recently that had dukkah in it. I googled the recipe and found another one. I saw yours only today after googling for the second time. I like yours and will be making it very soon. Just need to buy the ingredients. Thank you for your feedback June! You’ll see how easy it is to make homemade dukkah. Packaged in little jars or bags, dukkah makes great Christmas present. It was beautiful. Making it again today. Will add some sumac for a change. Thank you for the recipe. How much sumac would I add? It’s a matter of taste. Start with two teaspoons, try it, then add some more if you like. Made this for the first time tonight (with almonds & macadamias) when my husband had a hankering for dukkah! Possibly because I’d also made some bread today, ha ha. I roasted the almonds for a little too long (had the heat too high initally) but it still turned out well. Added a bit more cumin than the recipe suggested as well as some chilli flakes, ground ginger and paprika – which gave it a hint of sweetness. Hubby didn’t want any green herbs in it but I think oregano would’ve gone really well in it! Anyway, he is now feeling full and fat and happy after his meal! Thanks for the recipe, it was very helpful – especially considering I was planning on using raw nuts to begin with and then thought I’d better Google it just in case…phew!